Lakeland voters have a lot of questions about the strong mayor initiative on the Nov. 7, 2017, election ballot. Our aim here is to provide objective and understandable answers. Here’s a portion of the sample ballot. The strong-mayor issue is posed as a yes-no question. Yes means you want to change Lakeland’s form of government to the strong mayor format. No means you don’t want that change. This is a living document that will be added to and updated regularly between now and Election Day. Please send additional questions, corrections or comments to newstips@lkldnow.com. NOTE: Click on an arrow to see the answer. If you’d prefer not to click on the arrows, check this version. The basic issue is: Are we going to change the form of city government in Lakeland to one in which the chief executive is a mayor elected by voters rather than a city manager appointed by city commissioners. The current form is called council-manager; the seven elected city commissioners hire a city manager to serve as chief executive, running the city’s administration. The ballot proposal would change city government to a strong-mayor form in which voters directly elect a mayor as chief executive to run the city departments. What’s with the “Yes People’s Mayor” and “No Boss Mayor” signs? A lot of people have been asking about this, so I’ll give a short answer up high. Read on for more details. The “Yes People’s Mayor” signs are put up by those who want a strong mayor, also known as an executive mayor. The “No Boss Mayor” signs are put up by those who are against the strong-mayor initiative. Who is proposing the change? A group called Committee for a Strong Lakeland organized around the idea that a strong mayor would be more accountable to the voters and would be able to act more decisively than a seven-member commission. Their website is here. (You might want to turn the volume down if you’re in a public place; as soon as you reach the site, a video plays with the audio turned on.) Their founding document is here. Members of the committee are: Bruce Anderson, Gregory Fancelli, Usman Faruq, Chris McLaughlin, Brooke Agnini, Grant Miller and Natalie Oldenkamp. The group is often represented in public forums by Matt Doster of Front Line Strategies, a Tallahassee political consulting firm. How did the issue get on the ballot? Committee for a Strong Lakeland held public meetings in 2015 and then drafted a city charter, which is essentially the constitution for the city of Lakeland. Essentially they took the existing charter and rewrote the appropriate parts. Then they organized a petition drive and collected more than 6,038 signatures, which represents 10 percent of registered voters in the city. 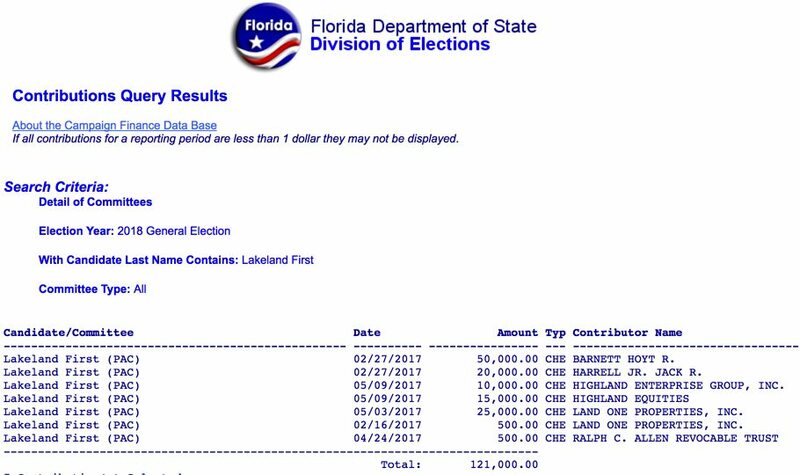 The Polk elections supervisor certified that the signatures were legitimate, which obligated the City Commission to put the issue on an election ballot. The City Commission had control over the ballot wording (which involved much debate) and whether it would be on the Nov. 7 general election ballot or be voted on earlier than that. What are the main selling points for a strong mayor system? Committee for a Strong Lakeland argues a mayor elected by the public is more responsive and can act more quickly and decisively. An elected mayor would be able to set clear policy goals that would be outlined during election campaigns, the group says. I thought Lakeland already has a mayor. Yes, it does. Howard Wiggs is the current mayor. In the current system, the mayor’s main duties are much more limited than the ones being proposed. In the current system, the mayor is the chair of the City Commission and represents the city at ceremonial functions such as ribbon cuttings and at regional meetings. Is there organized opposition to the strong mayor proposal? Yes. An organization called No Boss Mayor formed to oppose the ballot initiative. Their website is here. Their founding document is here. The group’s chairman is Larry Durrence, who was a city commissioner in the 1980s and is currently running for a City Commission seat. The group is often represented in public forums by former City Manager Gene Strickland, former City Attorney Joe Mawhinney, and former Mayor Gow Fields. What are No Boss Mayor’s major objections to a strong mayor? The group feels the current system works well and says the proposed charter gives too much power to one person while diminishing the power of the City Commission. Aren’t there checks and balances? The strong-mayor proponets say they built in several checks on power. For example, the City Commission passes the city budget. The proposed charter says they can investigate city departments and issue subpoenas. If popular support for the mayor wanes, a recall election can be held. The No Boss Mayor side says that under the proposal the mayor has all the power and the City Commission has little. Two things they point to is the fact that the mayor can veto any line item in the budget and the fact that if the City Commission passes a budget item the mayor doesn’t like, he or she can just neglect to spend the money. They also say nothing would compel a mayor to answer City Commission questions if he or she didn’t want to. State law required that the issue be posed as a yes/no question. “Yes” means you want to change to a strong-mayor system. “No” means you don’t want that particular change. Where can I see the proposed City Charter recommended by Committee for a Strong Lakeland? Here. It’s a 22-page, single-space document full of legalese. The blue text represents additions to the current City Charter, and the red text represents content that would be removed. When we vote for mayor (also on the Nov. 7 ballot), how do we know if the person we elect will be under strong mayor or the current format? Good question. There is confusion, but both sides agree that the person elected will fill the role of strong mayor starting Jan. 1 if the issue passes. If it doesn’t pass, the role of mayor will remain as it is now. The four candidates for mayor say they are prepared for either role. Strong-mayor proponents wanted to hold the vote on the new charter in August or September; one of the reasons was so voters and candidates would know which mayor position they’d be voting for in November. A 5-2 majority of city commissioners decided to hold the vote in November, saying turnout would be stronger then. Who can vote? When and where? Any registered voter whose registration lists an address within Lakeland city limits can vote in the election. Polling places will be open Nov. 7 from 7 a.m. to 7 p.m. Here’s a list of polling places. If you don’t know your precinct, you can look it up here. Vote by mail. Registered voters can request a mail-in ballot until Nov. 1 at 5 p.m. Get details here. Walk-in voting is available Oct. 30 through Nov. 6 at the Lakeland Polk County Government Center, 930 E. Parker St. It is open Monday through Friday from 8:30 a.m. to 4 p.m., and Nov. 4 from 10 a.m. to 2 p.m. It is closed Nov. 5. The ballot also includes the race for mayor and three city commission seats. If you are not currently registered to vote, you’ve missed the cutoff date for this election, but you can register to vote in future elections. Get more info here. I keep seeing signs and hearing terms like “strong mayor,” “executive mayor,” “people’s mayor” and “no boss mayor.” Which terms go with which side? Which organizations and individuals have endorsed Strong Lakeland? Which organizations and individuals have endorsed No Boss Mayor? In addition, the group’s website lists numerous supporters. Where is Strong Lakeland getting its financial support? The organization has received $382,418 in contributions through the end of September. Almost all of it — $379,000 — came from Gregory Fancelli, a businessman with interests in development and historic preservation. Where is No Boss Mayor getting its financial support? The organization has received $73,173 in contributions through the end of September. The biggest donor is the International City/County Management Association, a trade organization, which has provided $29,500. The effort has also received $5,000 donations from four people or organizations affiliated with the Lakeland First political action committee and/or the Lakeland Economic Development Council. How does the proposal affect Lakeland Electric? Committee for a Strong Lakeland was sensitive to the role of Lakeland Electric in drafting their proposal, in part because they wanted to make it clear their effort had nothing to do with 2012 discussions about making it easier to sell the utility. The proposed charter also puts the manager of Lakeland Electric under the City Commission instead of the mayor. No Boss mayor has used as one of its talking points that it’s impractical to separate on large and very important branch of city government from the rest of the departments. The current city charter limits an officeholder to no more than 12 years on the City Commission or 16 years combined as city commissioner and mayor. The Committee for a Strong Lakeland proposal maintains the 12-year limit for commissioners but adds up to two terms as mayor. What happens to City Manager Tony Delgado if strong mayor passes? Only Tony knows. All four candidates for mayor have said they’d like to have him stay on as chief administrative officer, a new position created in the proposed charter. Delgado hasn’t said whether he’d accept the second-in-command job. If he were to accept, he would have to relinquish his membership in the International City/County Management Association, which could affect future job prospects. How would the role of the City Commission change? Currently city commissioners, by majority vote, set policies, pass laws, rule on land-use issues, set taxes/fees and pass a budget based on a document submitted by the city manager. The Strong Lakeland proposal divides functions with the mayor taking over executive duties and the commission retaining legislative functions: passing laws, setting tax rates, etc. The mayor would be able to veto (overturn) acts of the commission or individual items within the budget. It would take a vote of at least 5-2 for the commission to override the mayor’s veto. As mentioned elsewhere, the commission would also supervise the manager of Lakeland Electric. Will a strong mayor cost more money? The executive mayor, whose salary would be at least $100,000 and possibly twice that. (The salary would be set by the City Commission with a $100k minimum.) Eliminated under the proposal is the current weak mayor position, saving $44,600. A chief administrative officer, whose duties and salary would probably be similar to the current city administrator, a position that would no longer be needed. A seventh city commissioner, who would be paid nearly $30,000. No Boss Mayor representatives also point to the specter that the City Commission may find it necessary to hire its own financial expert(s) to keep tabs on the administration. Strong Lakeland says the new salaries are small compared with the hundreds of thousands of dollars a mayor will be able to save if he or she quits hiring outside consultants. Who would the city attorney report to? The city attorney, who is responsible for giving legal advice, drafting legal documents and defending lawsuits, currently reports to the City Commission and is the only city employee who doesn’t work for the city manager. Under the strong mayor proposal, the city attorney would report to both the City Commission and the mayor; he or she would be hired by the commission with the consent of the mayor; it would take an agreement of both sides to fire the city attorney. What is the recourse if the public loses confidence in the mayor? The main recourse would be electing a different mayor in the next election. State law also provides the possibility of a recall election, but that tool is rarely used in Florida. Where can I review news coverage and debate videos? Articles: TheCityZenShip is curating news coverage about the strong-mayor coverage here. Send them to newstips@lkldnow.com. We’ll be updating this document.